Stickers of all kinds are a common sight on the streets of London (Photo: Hannah Awcock, 12/03/15). Gender-related issues and sexism have been hot topics of debate recently, thanks to campaigns such as #MeToo, and Time’s Up. #MeToo was a social media campaign to demonstrate the prevalence of sexual assault and harassment, with women sharing their own experiences to show just how common it is. The Times Up movement calls for an end to sexual harassment, assault and inequality in the film industry, developing in response to the Harvey Weinstein scandal. Many women wore back at the 2018 BAFTA awards to show their support. The campaign has also had an effect in the music industry, with attendees at the 2018 Brit awards showing their support by carrying white roses on the red carpet. This is a recent upsurge in an ongoing series of struggles to achieve gender equality that is reflected in London’s protest stickers. To see where I found these stickers in the city, check out the Turbulent London Map. This sticker was produced by Revolutionary Socialists in the 21st Century. It is quite common on London’s streets (Photo: Hannah Awcock, Gordon Street, Bloomsbury, 12/03/15). This sticker connects feminism with anti-fascism. They two flags is the most common symbol of anti-fascism, and the phrasing of the sticker is also often associated with anti-fascist stickers; “Goodnight White Pride” is a particularly common phrase (Photo: Hannah Awcock, Albany Road, 02/04/15). Class War is an anarchist group that organises direct action against a society that it sees as deeply unequal. The Women’s Death Brigade is a branch of Class War with a feminist focus (Photo: Hannah Awcock, Euston Road, 05/09/15). Intersectionality is the idea that different aspects of a person (race, gender, sexuality etc.) do not exist separately from each other. Therefore, in order to solve issues such as sexism or racism, we need to combat all of them simultaneously, not just one. This sticker links sexism and homophobia, as well as representing Snow White in a more violent pose than we’re used to (Photo: Hannah Awcock, New Cross Road, 20/03/16). Sisters Uncut is a direct action campaign group formed to protest against cuts to domestic violence services in the UK. Research suggests that women are disproportionately affected by recent austerity, bearing more of the burden than men (Photo: Hannah Awcock, Lewisham Way, 20/03/16). One of Sisters Uncut’s best known tactics is crashing red carpets-they did it at the premier of the 2015 film Suffragette, and the 2018 BAFTA awards. The colours that Sisters Uncut use, white, green, and purple, echo those of the suffragette group the Women’s Social and Political Union (Photo: Hannah Awcock, Torrington Place, 20/10/15). This is arguably more of a poster than a sticker, but I liked it too much to leave it out. George Osborne was the Chancellor of the Exchequer between 2010 and 2016 (Photo: Hannah Awcock, 20/03/16 New Cross Road). Sexual consent has been another big issue for feminist campaigns in recent years. I Heart Consent is an educational consent campaign ran by the National Union of Students and Sexpression UK which focuses on universities and colleges (Photo: Hannah Awcock, Charing Cross Road, 23/03/17). This photo is a fantastic illustration of how the placement of a sticker can contribute to its meaning and impact (Photo: Hannah Awcock, King’s College London, 31/05/15). Lauren Elkin. Flaneuse: Women walk the City in Paris, New York, Tokyo, Venice, and London. London: Vintage, 2017. RRP £9.99 paperback. As a Geographer, the flaneur is a familiar figure. It refers to some one who walks through cities, normally with no specific destination in mind, observing the city, it’s people, and it’s character. Flaneurs are mostly wealthy, and overwhelmingly male. But that has never quite sat right with me. After all, I love wandering around cities seeing what I can see, and I am not wealthy. Or male. So when I first heard Lauren Elkin speak, at an event at the Museum of London, I was intrigued by what she had to say about the female flaneur; the flaneuse. But surely there have always been plenty of women in cities, and plenty of women writing about cities, chronicling their lives, telling stories, taking pictures, making films, engaging with the city in any way they can…The joy of walking in the cities belongs to men and women alike. Flaneuse: Women Walk the City in Paris, New York, Tokyo, Venice, and London is hard to categorise. It’s publisher defines it as memoir/social and cultural history and whilst this sounds like an odd mix, it is quite accurate. I think at its heart, it is an argument to redefine the concept of the flaneur to include women. Elkin offers up her new definition, and then spends the rest of the book providing us with examples; attempting to persuade us of the existence of the flaneuse. As evidence, Elkins tells us about women whose walking in cities is in some way central to who they are, such as their identity or livelihood. Some of the examples are well known; Virginia Woolf in London and George Sand in Paris. Others are perhaps less so: French filmmaker Agnes Cards in Paris and Elkin herself in Tokyo and Paris. I would say Elkin makes a very convincing argument, but she was pushing against an open door with me; others may be harder to convince. If you are expecting a straight social history of women walking in cities, then you will be disappointed. It is more a series of snapshots into this history. Some of these snapshots contain quite detailed descriptions of the cultural outputs of the women featured, such as the novels of Jean Rhys and the art of Sophie Calle. Elkin is an English Lecturer, and at these points in the book this background comes through the clearly. In this way, Flaneuse is similar to Nightwalking: A Nocturnal History of London by Matthew Beaumont, about the writings of the (overwhelmingly male) people who walked the streets of London after dark. Nightwalking feels like a more coherent history than Flaneuse, but that is largely because it focuses on one city rather than five. To be fair to Elkin, I don’t think she set out to narrate a history, and what she has done is done well. I read Flaneuse over two days, mainly on two long journeys. Even if I am enjoying a book, I sometimes lose focus after an hour or two of reading. This wasn’t the case with Flaneuse; chapter after chapter kept me hooked. Elkin is a good writer, her work is engaging and thoughtful. The book is a nice balance of Elkin’s own story and the stories of the women and cities who have shaped her. Some sections of Flaneuse were published elsewhere first, but there was only one point that I guessed the book wasn’t written as a coherent whole. The chapter on Tokyo revolves around Elkin’s relationship with a French banker–she moves to Japan to be with him when he is transferred. In a later chapter, she mentions this relationship as if she is telling the reader about him for the first time. It is a minor detail however, perhaps made so noticeable because it is the only such slip-up in the whole book. Each chapter is named after the city in which it is set. I think this is slightly misleading as, although the cities are very important, it is the women who wander them that are the book’s driving force. I thoroughly enjoyed reading Flaneuse: Women Walk the City in Paris, New York, Tokyo, Venice, and London. I would recommend it to anyone interested in women’s or urban history, anyone who fancies something a bit different, or anyone who just appreciates a good book. Jenni Murray. A History of Britain in 21 Women. London: Oneworld, 2016. RRP £9.99 paperback. A few weeks before Christmas, I was browsing a bookshop when I noticed the vibrant cover of A History of Britain in 21 Women by Jenni Murray. I was sorely tempted, but, remembering my overflowing bookshelves and the growing piles of books at the bottom of my bed, I restrained myself. I put the book on my Christmas list instead, so I at least didn’t have myself to blame when my piles of books grew a little bit taller. I am very glad that I was given the book; it is a thoroughly enjoyable read that has left me more determined than ever not to allow misogyny to hold me back. The twenty-one women in this book rose above the low expectations of their gender and defied anyone who insisted ‘a girl can’t do that.’ Slowly, slowly, over the centuries, they changed the gender landscape for those of us who came after. As the name implies, A History of Britain in 21 Women profiles 21 women from British history. Each chapter is about 15 pages long, and details the women’s biography, their achievements, and their impact on society, politics, and culture. The selection is historically comprehensive, beginning in the first century with Boadicea, and ending in the modern day with Nicola Sturgeon. Inevitably, many women are left out, but Murray is careful to justify her choices, explaining why the 21 she chose resonate with her personally. The book is more personal than I was expecting. It does have the subtitle A Personal Selection, but this is only mentioned in the front matter, not on the title. After initially being unsure about this, I came to enjoy Murray’s short personal reflections and anecdotes. I was particularly charmed by a conversation she describes having with one of her sons when John Major took over from Margaret Thatcher as prime minister. Beyond being thrown at first by the tone of the book, I can find very little to criticise in A History of Britain in 21 Women. Each chapter is self-contained, so it feels almost like a collection of short stories, but I wasn’t put off if I read several chapters in one sitting, as I often am with similarly structured books. Each chapter is accompanied by a portrait by Peter Locke, the style of which suits the book’s message really well. Locke’s sketches don’t feel idealised or ‘touched up,’ the women in the sketches feel…real; they look like they’ve lived. It’s quite hard to put my finger on it, but I like them. It is the women themselves, their lives, actions, experiences, and attitudes that are the real stars of this book. Some of them are familiar–such as Elizabeth I, Jane Austen, and Margaret Thatcher–whilst others are less well-known–like Aphra Behn, Mary Somerville, Gwen John. But they are all remarkable. Every one exelled in the field they chose, whether it be medicine, art, politics, or science, often despite massive obstacles and prejudice. They are inspirational. I was given A History of Britain in 21 Women as a Christmas present, and I do think it makes a wonderful gift, even for those who aren’t avid readers. It’s especially good for those who need a reminder of just how much it can be possible to achieve. Turbulent Londoners is a series of posts about radical individuals in London’s history who contributed to the city’s contentious past, with a particular focus of women, whose contribution to history is often overlooked. My definition of ‘Londoner’ is quite loose, anyone who has played a role in protest in the city can be included. Any suggestions for future Turbulent Londoners posts are very welcome. The next Turbulent Londoner is Harriet Taylor Mill, a radical thinker who made a significant contribution to the work of John Stuart Mill. Harriet Taylor Mill, around 1834 (Source: National Portrait Gallery). The well-known phrase ‘Behind every man is a great woman’ could have been invented for the philosopher John Stuart Mill. His wife Harriet Taylor Mill was hugely significant to his work, and, whilst we may never know the full extent of her contribution, she may well have co-authored substantial amounts of the writing attributed to him. She was also a radical thinker and writer in her own right. Harriet Hardy was born in Walworth, south London on the 8th of October 1807. The daughter of a surgeon, she was educated at home. Her relationship with John Stuart Mill was unconventional, even by modern standards. In 1826 Harriet married he first husband, the merchant John Taylor. They had three children. Four years into their marriage, Harriet became active in the Unitarian church community in London, and was introduced to John Stuart Mill. The two became close friends, exchanging essays on marriage and women’s rights. 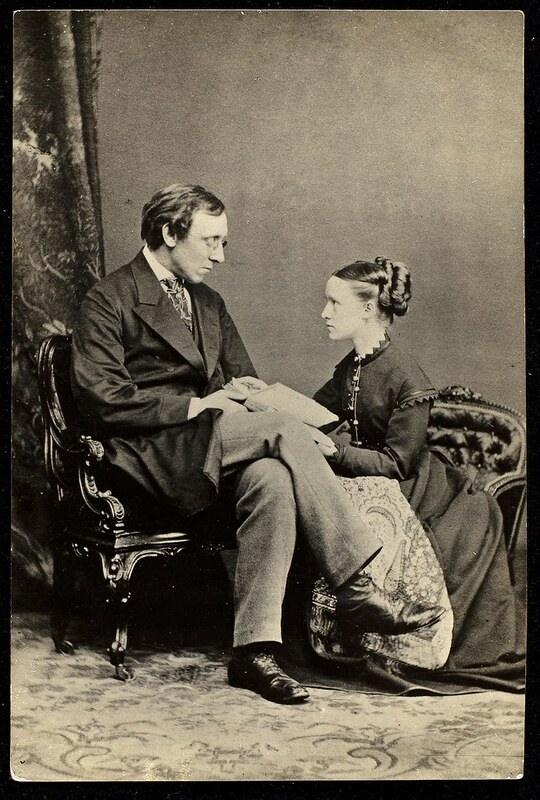 Mill was the first man to treat Harriet as an intellectual equal. Harriet was the more radical of the two, criticising the degrading effects of women’s economic dependence on men. She believed the situation could only be changed by the drastic reform of marriage laws. By 1833, Harriet was living apart from John Taylor with her daughter, Helen. She spent six weeks in Paris with John Stuart Mill, and despite claiming they did not have a sexual relationship, they caused a scandal that left them both socially isolated. Harriet lived in a house in Walton-on-Thames, and Mill visited her at the weekends. John Taylor eventually accepted Harriet’s relationship with Mill, on the condition that she move back in with him. John Taylor died in 1849, and Harriet married Mill two years later. The same year, 1851, ‘The Enfranchisement of Women’ was published by The Westminster Review. It is one of the few pieces of writing that can be solely attributed to Harriet, but at the time it was published in Mill’s name. Mill would build on Harriet’s arguments in The Subjection of Women (1869), although his arguments were less radical than Harriet’s. Harriet published little of her own work, but contributed extensively to Mill’s. It is hard to know exactly the extent of this contribution though. At least, Harriet commented on all of Mill’s writing. In his autobiography, he claimed that she co-authored most of his work. In 1832, Early Essays on Marriage on divorce was published, co-authored by Harriet and Mill. It is unclear why Harriet might have been reluctant to take credit for her work– perhaps she was worried it would affect how the ideas were received. What was clear, however, was that Mill valued Harriet’s contribution; he dedicated On Liberty (1859) to her. In her later years, Harriet traveled a lot due to ill health. She died in Avignon on the 3rd of November 1858. Mill bought a villa near Avignon, and spent most of the rest of the life there. Harriet’s daughter Helen helped Mill finish The Subjection of Women. Even if Harriet Taylor Mill wasn’t a significant contributor to the work of John Stuart Mill, I think she would be worthy of admiration for to bravery she showed in pursuing happiness in her personal life in the face of social ostracism. Although the extent of her abilities will probably never be know for sure, she was also an accomplished thinker and writer. She deserves recognition. Anschutz, Richard Paul. “John Stuart Mill.’ Encyclopaedia Britannica. Last modified June 15, 2017, accessed November 9, 2017. Available at https://www.britannica.com/biography/John-Stuart-Mill.